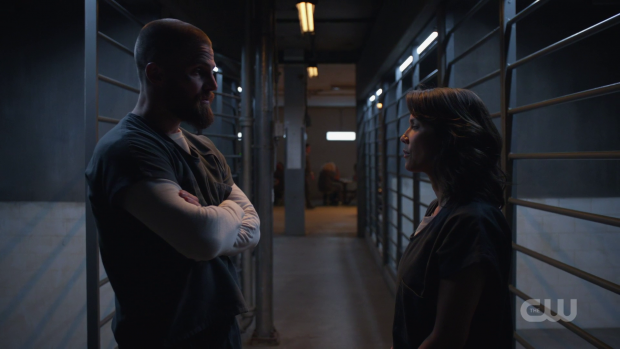 Arrow continues to intensify the risk to Oliver Queen as his incarceration in Level Two continues as Felicity takes it upon herself to provide some outside assistance. Five completed episodes and Oliver Queen is still in prison. I must say I’m shocked that this story has gone on so long and I’m pleased that it’s still compelling to watch. Each episode brings something different and the story must have been a welcome acting challenge for Stephen Amell who consistently thrives. This story is a risk for the show as it keeps the main character apart from the rest of the cast most of the time. To date he’s had one scene with Felicity, one scene with Diggle and a hallucinatory interaction with William. For a network TV show that has a certain formula to stick to in order to create the best chance for success this is really bold and certainly appreciated. Last week saw Oliver at the hands of Dr. Parker; a therapist who either wanted to help him or torture him. This episode throws out that ambiguity in favour of making him the villain of the piece. Level two is an off the books house of horrors where inmates are experimented on to the point that they completely lose who they are. Shades of that were seen last week when Oliver identified himself as “Inmate 4587” to suggest that he was well on his way to being broken by what he was forced to endure. The risk here is that the man that was Oliver Queen could be lost forever if Dr. Parker is allowed to continue with his treatment methods. All of this takes place behind a mysterious blue door where prisoners go to die. It sits on Level Two as a monolithic threat that keeps the prisoners in line because they don’t want to end up in there. Oliver eventually recognises what that represents and the hero inside him sets about doing something about it. It takes a while for Oliver to want to take action as he needs some encouragement to shake him out of the fog that his treatment has him under. This happens after he is introduced to the mysterious Demon who turns out to be none other than Talia al Ghul. I’ll admit I didn’t see this reveal coming though I probably should have considering the name. I was more fixated on Stanley being more than he seemed rather than thinking that a previously established character would be brought back. Talia hasn’t been seen since the season 5 finale when she was apparently blown to bits on the island. She survived that and ended up in Slabside Prison after a run-in with an old foe in Gotham. Is this another Batman reference or is Batwoman the Arrowverse analogue? It’s hard to say since Bruce Wayne definitely exists but maybe that question will be answered eventually. Either way it’s a fun reference that makes for a decent explanation of why Talia is in the prison. Talia and Oliver’s interactions are great to watch as they take advantage of their history together. As viewers we haven’t seen that much of them but their relationship goes back years and started off as a student/teacher pairing. Talia is the one who taught Oliver that he needs to compartmentalise two sides of himself and use the identity of the Hood/Green Arrow as an outlet for his darker impulses so that he can live a relatively healthy life as Oliver Queen. Over the years Oliver has realised that this was the wrong approach and he puts it most eloquently in this episode when he tells Talia that doing what she suggested only gave the darker side of him more power that eventually spiralled out of control and consumed everyone around him. Dr. Parker was right about one thing as far as Oliver is concerned; his exploits in costume have caused untold pain to those he cares about. For proof of that we just need to list those that have died in order to get to him in some way. Not to mention what Felicity and William are currently dealing with. Oliver’s realisation allows his relationship with Talia to progress as he’s no longer her student because he no longer wants or needs to learn any of her lessons since he believes that the answers lie in another direction. I get the impression that he doesn’t really know what the answer to that is but it’s not really a pressing issue with him being in prison. Talia does seem proud of this realisation and points out that he’s surpassed her teachings in some way though I don’t really buy that as genuine as I fully accept that Talia firmly believes in the wisdom she imparts to others. This is very much a story about Oliver Queen deciding that sort of man he is and wants to be. This is summarised by his confident “My name is Oliver Queen” declaration. A fair amount of animosity exists between Talia and Oliver because Oliver killed Ra’s al Ghul. She hates him for that and let that hatred define their last encounter at the end of season 5. In order to work together now common ground has to be found between them which means that Oliver has to explain himself. He talks about killing Ra’s and how that decision was made at a point in his life where he was still letting his inner darkness inform his decision making. Talia sees this as an excuse and an attempt to deflect the blame for her father’s death onto her but Oliver accepts full responsibility for that action because he couldn’t see past what Ra’s al Ghul wanted to do to his city. I like that Oliver doesn’t apologise for his actions because he stands by them but takes the time to make Talia understand why he killed her father. The ensuing team-up is nothing short of awesome. 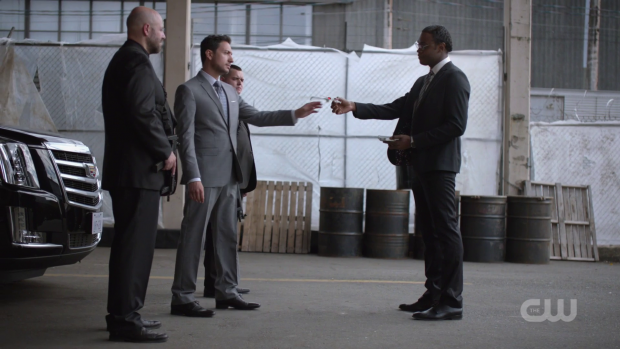 Arrow has always been a show that delivers well choreographed action sequences and this episode provides some of the most memorable. The corridor sequence is well shot, well choreographed and appropriately exciting with Oliver and Talia operating in pretty much perfect sync with one another. It’s a great visual to establish how much Oliver learned from her and how much he has grown since that time learning on his own. Oliver’s decision to stay in prison while letting Talia go with the information she needs to combat the corruption makes sense as it reaffirms his motivation for being in there in the first place. He let himself be locked up to protect his family and stays there for those same reasons. Leaving now would make him a fugitive for the rest of his life which would negatively affect those he cares about so staying is the best thing for them as far as he’s concerned. Related to this but only touched on is the idea that prison is an inherently cruel and corrupt place to send people. The system is so badly broken that illegal experiments are allowed to happen without anything in place to protect those being victimised. Perhaps once Oliver is inevitably released there will be a moral dilemma associated with what to do with the criminals he brings down as he has first hand experience of what happens to people on the inside so will have a decision to make on whether it’s right to subject them to that. It’s an interesting thing for a superhero show to play with as bringing criminals to justice is often seen as the undeniable right thing to do but what if it isn’t? Can Arrow approach that question and reach a position on it? Is the law actually worth fighting for if that’s what happens to those who break it? What punishment is justifiable? All great questions that I would love to see explored. Felicity and Evil Laurel’s partnership continues to be an engaging one even if they don’t really accomplish much in the context of the episode. In terms of contribution all they do is look through boxes to find information that proves there is corruption within the prison system. This information ends up coming to Felicity via Talia anyway so a lot of their scenes feel like wheel spinning to keep the characters in play. Thankfully their dynamic largely saves it with something of a role reversal between the two characters. 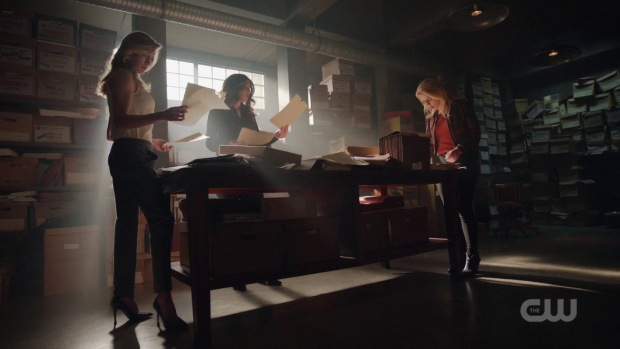 Felicity wants to find her inner Evil Laurel to solve certain problems where Evil Laurel is more calculating and rational. It shows that she has no personal interest in protecting Oliver Queen and suggests that she may not be as bad as everyone assumes she is. Enlisting Dinah into this dynamic makes it all the better thanks to the constant animosity between her and Evil Laurel. Felicity is in the middle of their constant arguing and keeps them on task. It’s a tenuous partnership but an effective one as each of them has something unique to bring to it. The promise of a Team Felicity trip to Moscow to bring down Diaz is pretty tantalising so I hope it happens. Curtis gets his meatiest plot so far this season though the wrong approach is taken. 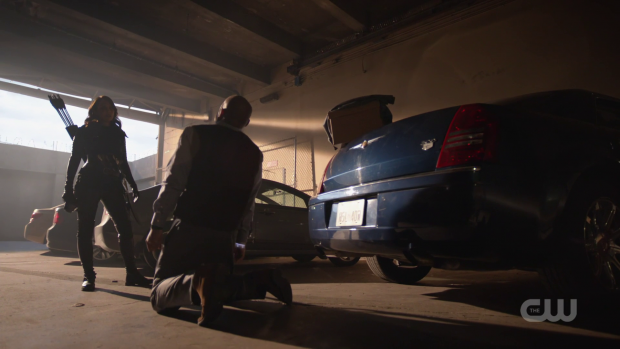 He is reluctant to go out in the field for reasons that are initially unknown until Diggle pushes him to open up about what bothers him. His explanation basically boils down to feeling that Mr. Terrific is in his past and something he no longer needs in his life to feel fulfilled. There was a real opportunity to explore the aftermath of being a vigilante and the lingering psychological effects this has. Curtis could and should be afraid to step back into the field because he suffers from some form of PTSD. If done right it could be an eye opening look into similar conditions and how they manifest in people. Instead it’s just another issue easily cured by a pep talk from Diggle who encourages Curtis to make a conscious decision to get back in the field because facing his fears is the right thing to do. It’s clumsy and fails to lean into the potential of this story. I can’t help but think that the writers don’t quite know what to do with Diggle and Curtis at this point so they are just killing time until the hinted at larger threat makes its appearance later in the season. Another strong episode that continues to bring new developments to the prison plot but drops the ball on some of the side stories. Oliver and Talia working together is really engaging as their relationship is a unique one. Her status as his former teacher is compelling because it encourages Oliver to show what he has learned since that time and explain why he has cast off some of the lessons learned from her as he has concluded that the Hood/Green Arrow identity only gave his darkness power rather than compartmentalising it to the point that he could otherwise live a normal life. When combined with Dr. Parker’s attempts to erase his identity this is very much a story about Oliver Queen coming to his own conclusions about the sort of man he is and forging ahead on that basis. He takes full responsibility for killing Talia’s father without apologising for it which makes her respect him enough to at least work for him and help him by taking necessary information to Felicity. The Oliver/Talia team-up also allows for some brilliantly choreographed and exciting action sequences. There is also the hint of exploring the idea of corruption in the prison system and how that affects Oliver’s decision to send criminals to a prison where he knows they will be mistreated. Felicity and Evil Laurel’s dynamic remains fun to watch even if they accomplish very little over the course of the episode. Adding Dinah to the mix makes for a volatile grouping that is insanely fun to watch. I look forward to their trip to Moscow to bring down Ricardo Diaz. Curtis is finally given some meaty plotting but it falls far short of being interesting due to how its executed. His reluctance to go back into the field has little more reasoning behind it than feeling like Mr. Terrific is behind hi. There was a real opportunity to explore the aftermath of being a vigilante and the psychological consequences this could have. In effect Curtis could have had a well told PTSD plot that carries through the season instead of something easily resolved by a pep talk from Diggle. This creates the impression that the writers don’t know what to do with some of the cast so just have Diggle and Curtis spin their wheels until the larger threat previously teased kicks in.